Sakura Japan Cherry Blossom Festival – Spring in Japan is definitely a special time to visit this wonderful country. 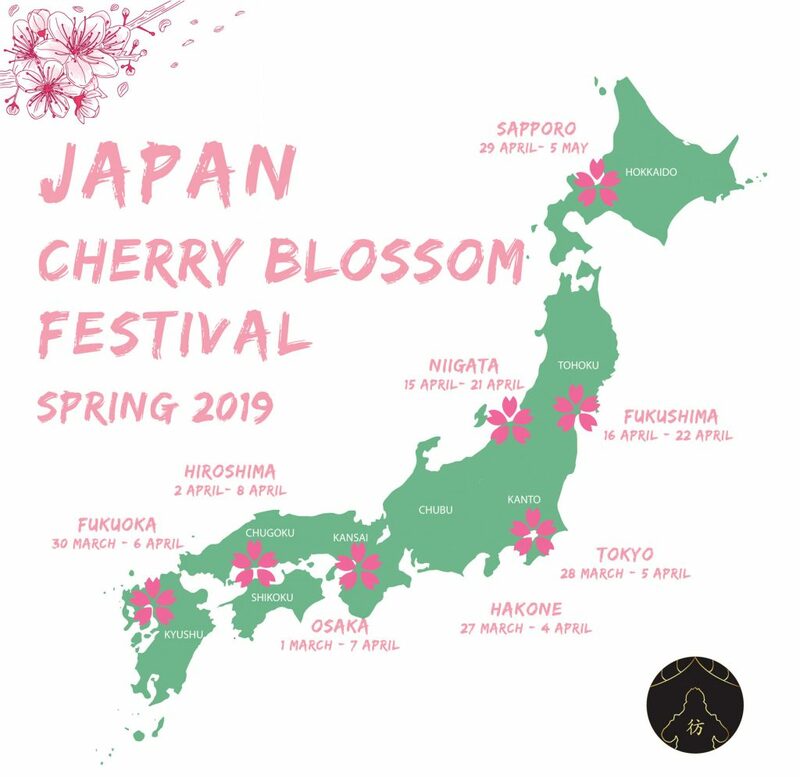 But before to get into the tips on when and where to see these beautiful flowers, let’s learn a bit more about the origins of this Cherry Blossom festival. Springtime in Japan has long been synonymous with cherry-blossom viewing. Whilst the age-old pastime of the Japanese has been shared generously with the world for a long time now, it wasn’t until the late 19th century that it began to arise in popularity worldwide. It is the believed that the celebrated tradition of ‘hanami’ (which translates to cherry blossom viewing) began all the way back in Japanese history during the Heian Period (794 – 1185), when what began as a practice of viewing and enjoying plum blossoms years before it evolved instead to viewing cherry blossoms instead, and ‘hana’ (meaning flowers) ultimately became tied to also meaning sakura. The custom was originally developed for only the elite of the Imperial Court, but soon spread to samurai society all over Japan, and by the Edo period, it had spread to all common communities as well. Japanese Shogun Yoshimun proactively planted cherry blossom trees to develop and encourage this practice. It soon also became customary to lunch and drink sake in picnics underneath the beautiful trees. 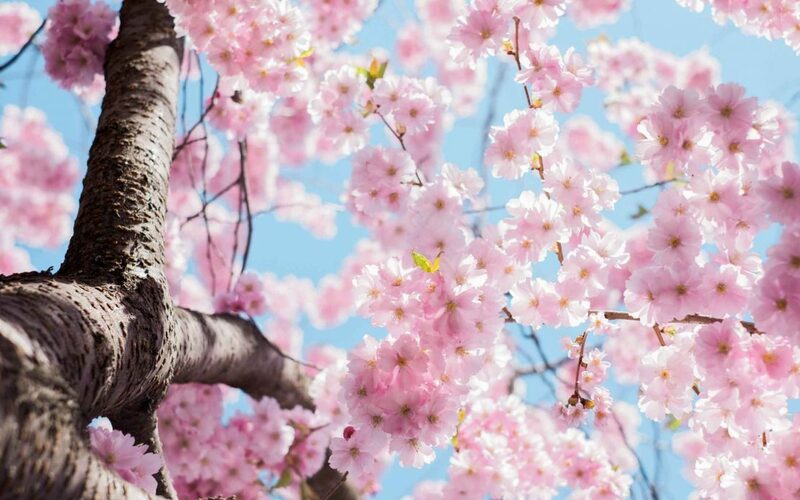 These days, the cherry blossom season of Japan, as fleeting as it is, brings in millions of visitors worldwide to experience seeing the exquisite blooms in person before it all fades away until the following year. 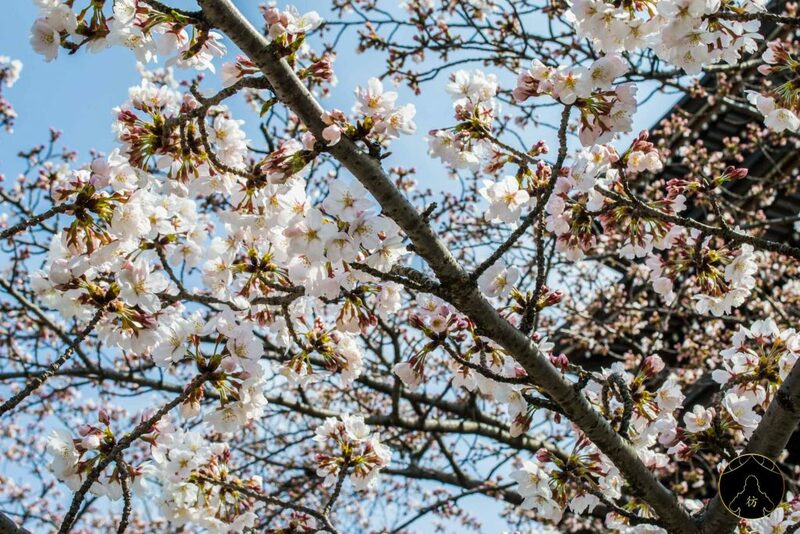 The Japanese Meteorological Agency and enthusiastic members of the public track the ‘sakura zensen’ (cherry blossom front) every year to try to predict the exact (or as close as they can get) dates of the blossoms throughout Japan. It usually begins in January in Okinawa (with its warmer climate), and reaches areas with higher altitudes and cooler temperatures like Hokkaido a few months later. 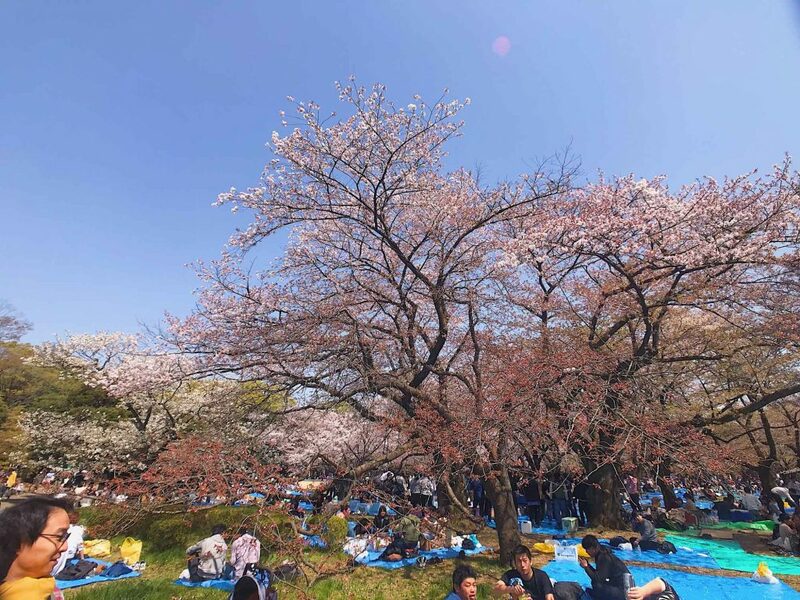 Hanami is now the tradition of groups of friends, family, co-workers, and everyone in between gathering together together to picnic and enjoy the beauty of the cherry blossom flowers. It is a day to consume food and drinks and get merry with everyone. People prepare games and music, and often spend entire days out under the blossoms and sun, celebrating into the night. Sakura Japan Cherry Blossom Festival– When? 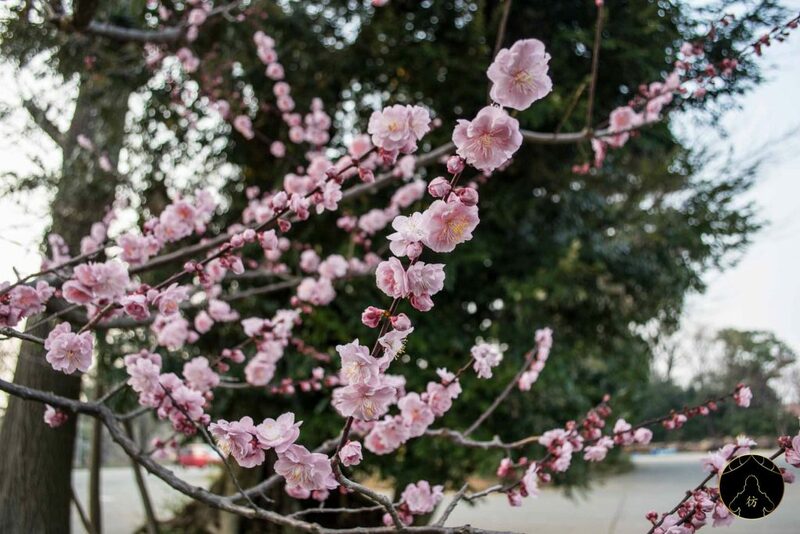 The first cherry blossoms generally begin in January in Okinawa, and from there, they will slowly move west through Honshu, all the way up to Hokkaido around the end of April. 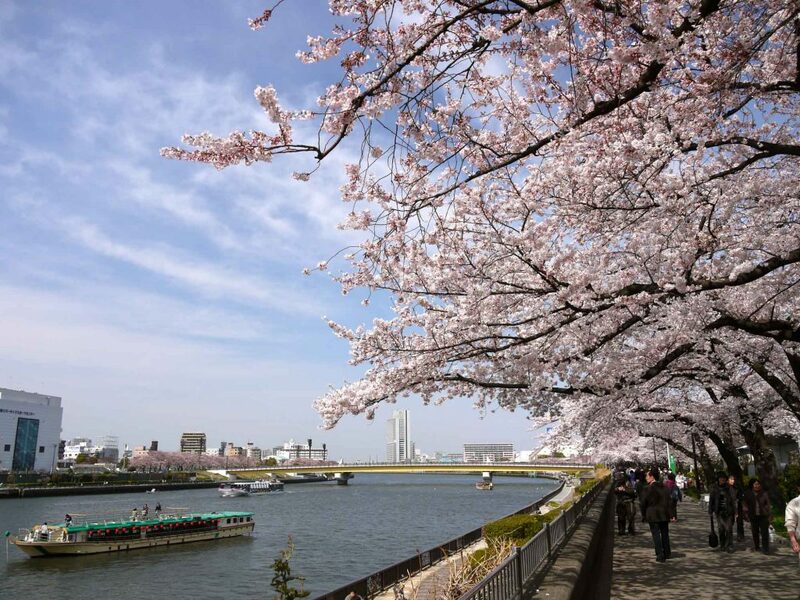 Most tourists will be visiting the cherry blossoms in areas like Tokyo, Kyoto, and Osaka, and this usually happens during the end of March until the early weeks of April. Depending on which area you are visiting, check regularly with the cherry blossom reports to see when the will be blooming. Sakura Japan – How do the Cherry Blossoms bloom? During most years, the full bloom of a flower (called ‘mankai’) is reached one week after the opening of the first blossom (‘kaika’). After another week, the blooming peak is usually finished and the blossoms begin falling from the sky. 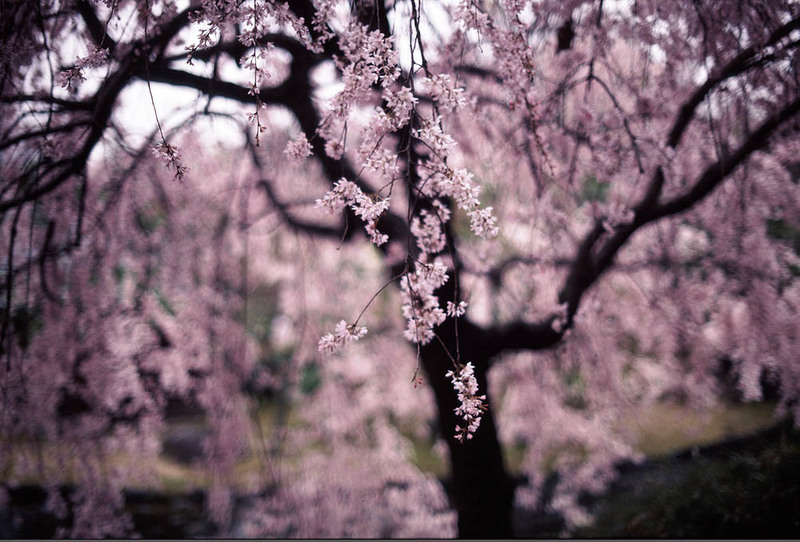 Naturally un-ideal conditions such as a rainy/windy season can cut the cherry blossom viewing period even shorter. 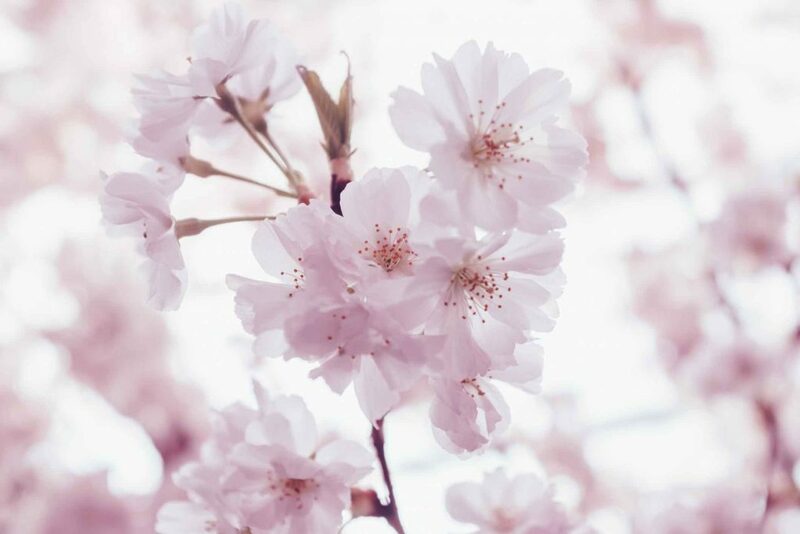 It is important to keep your finger on the pulse of cherry blossom reports if you are planning a trip specifically to view them in a particular area. Now that you know when to go to Japan to see the Sakura, let’s curate the best cherry blossom spots city by city. Every year, more than 800 cherry blossom trees bloom over the Meguro River which stretches over 4km. This area is particularly special because at night, the trees are all lit up in pinks lighting, lining the river and making it an extremely romantic scene to experience. Along the river, there are many food stalls open and people selling unique sakura-flavoured items, and amongst them is the Meguro special, sparkling wine or pink champagne sold by the glass. Access: From Meguro River, head downhill towards Yamate Dori. This cherry blossom viewing spot, which stretches from Azumabashi Bridge to Sakurabashi Bridge on the Sumida River, is one of the the most popular spots in the entirety of Tokyo, due to its concentration of sakura blossom trees (more than 1000!) and its location right by the river. If you position your photo properly, you can even capture the Tokyo Skytree in the background! Access: It is accessible via multiple stations, including Asakusa. 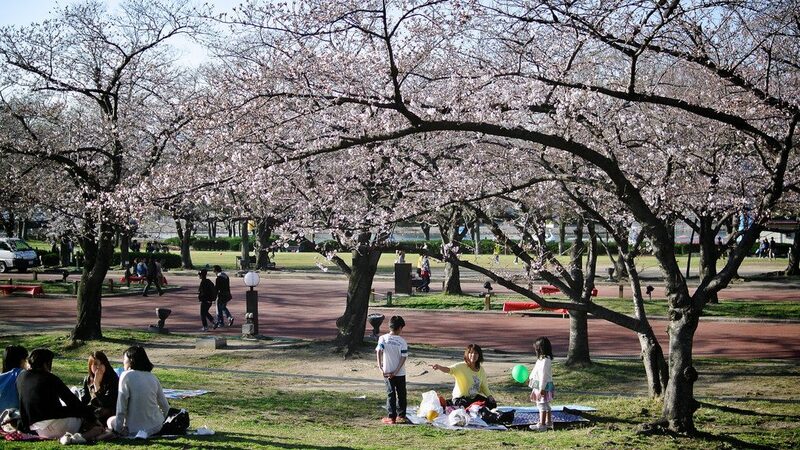 Although not a cherry blossom viewing area per se, Yoyogi Park is the premier destination for hanami picnics. Just like spending New Year’s Eve in Times Square, picnicking at Yoyogi Park is as classic as it can get. The overflowing charm and lively atmosphere at this location means that the large crowds hardly detract from the beauty of the place. In fact, being in the moment, surrounded by hundreds of beautiful cherry blossom trees, celebrating with hundreds of other equally appreciative people, you probably wouldn’t trade that experience for the world. Access: Head to Harajuku Station (Meiji-Jinguemae), and it is a 5-minute walk from there. During the cherry blossom season, about 450m of the Haya river is lined with a number of sakura trees. It makes for the most beautiful walk alongside the waters, with pink petals falling softly around you, landing on your hair, the floor, in the water. The Miyagino cherry blossom festival is held in early April, and during this period, night time viewing of the cherry blossoms is also an activity you can participate in. Access: Catch the train from Odawara Station to Hakone Yumoto station. Take the Hakone Tozan bus to Miyagino. The views from here is one of the best panoramic views you can get. 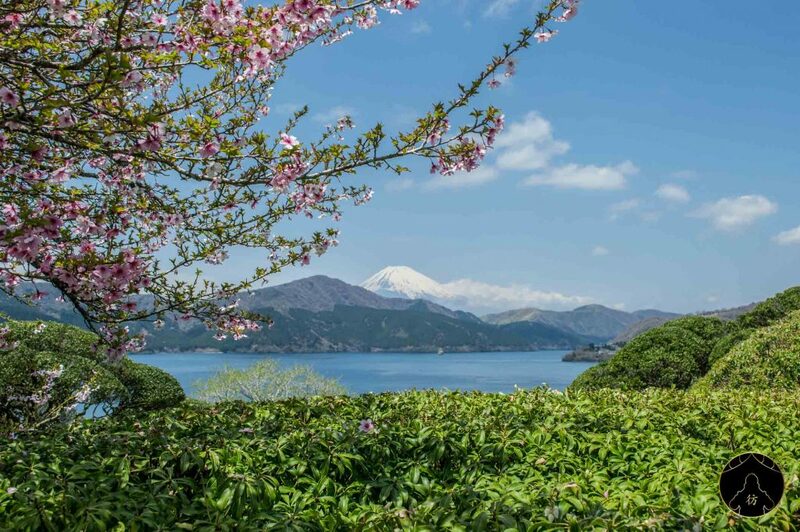 At this viewpoint, when you’re looking down and over at Lake Ashi, not only will the beauty of the cherry blossom stun you, but the background view of Mount Fuji (on a nice, clear day) will take your breath away. Access: Head to Hakone-Yumoto Station, and then take a mountain climbing bus towards Hakone-machi for 44-mnutes. Alight at Onshi-Kouen-Mae bus stop. One of the most popular places to view cherry blossoms in Kamakura is at Genjiyama Park, which is a public park on a mountain. Its an area where nature thrives, and attractions such as the spring cherry blossom and autumn foliage attract rather large crowds to celebrate its beauty by picnicking under the trees. If you want to tick off a few activities, there are hiking trails which can be accessed via this park that lead to Kitakamakura and Kotokuin (Kamakura Daibutsu). Access: From Kita-Kamakura Station’s west exit, head 5-minutes south towards the entrance of Daibutsu hiking course. Continue along the trail for 30-minutes until Genjiyama Park. 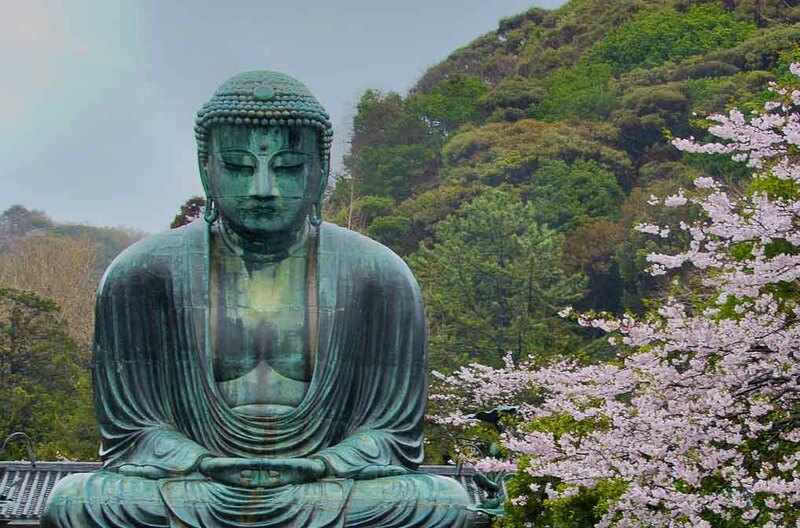 The Kotokuin Temple is home to the Great Buddha of Kamakura, making it a popular site throughout the year for visitors wanting to capture a glimpse and a snap of the awe-inspiring statue. However, during the cherry blossom season, the appeal of the statue is taken up a notch. Whilst there aren’t as many trees here as other cherry blossom viewing spots, the strategically placed statue and planted flowers means that once you get the right angle, the flowers will frame the statue beautifully, presenting you with an image you won’t be able to see anywhere else. Access: It is a 5-10 minute walk from Hase Station. 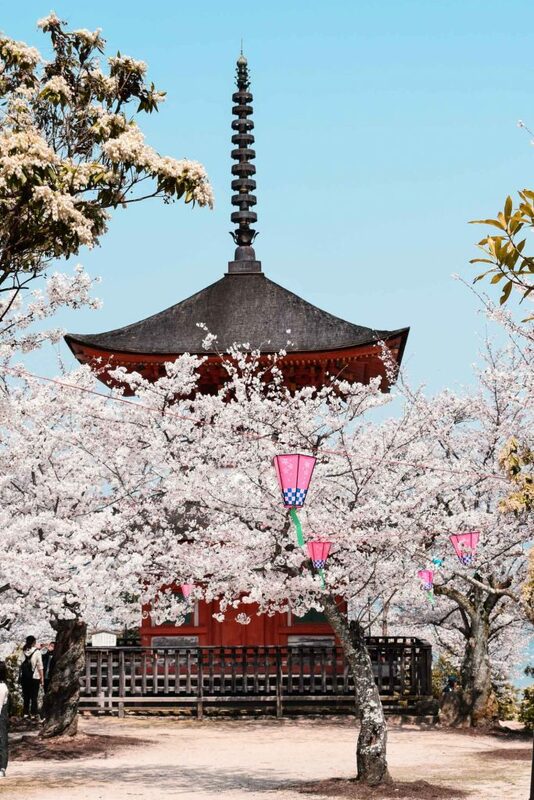 If you ever search up cherry blossoms in Japan, chances are, you’ve come across an image of the blossoms taken from Chureito Pagoda. It’s so famous of a cherry blossom viewing spot that many professional photographers make it their ultimate destination to capture the beauty of the flowers that represent Japan. 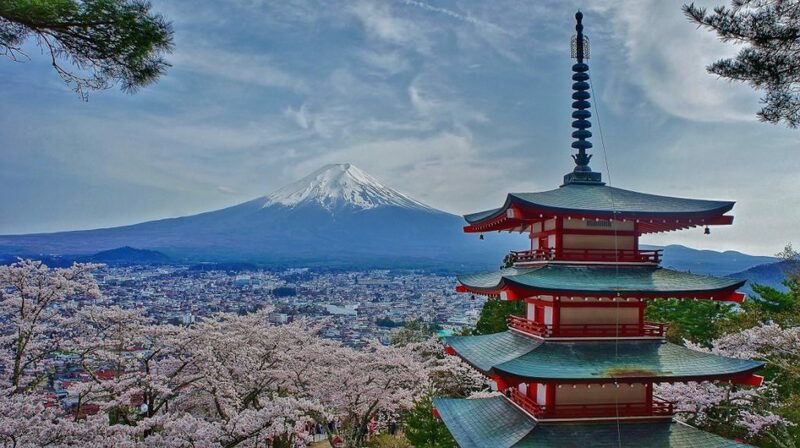 Be warned – you will have to climb around 400 steps to get to the pagoda, but the sweeping views of the area, with Mount Fuji in the background, soft pink petals falling around you and blossom branches framing your picture will make the trek all worth it. Access: Head to Shimo-Yoshida Station. The walk towards Arakura Sengen Shrine should take you 10-15 minutes, and then you will need to climb 400 steps. Lake Kawaguchiko is an absolute must when be visiting the Kawaguchi area. As one of the most popular lakes of the Fuji Five Lakes group, its garnered a name for itself for a reason! 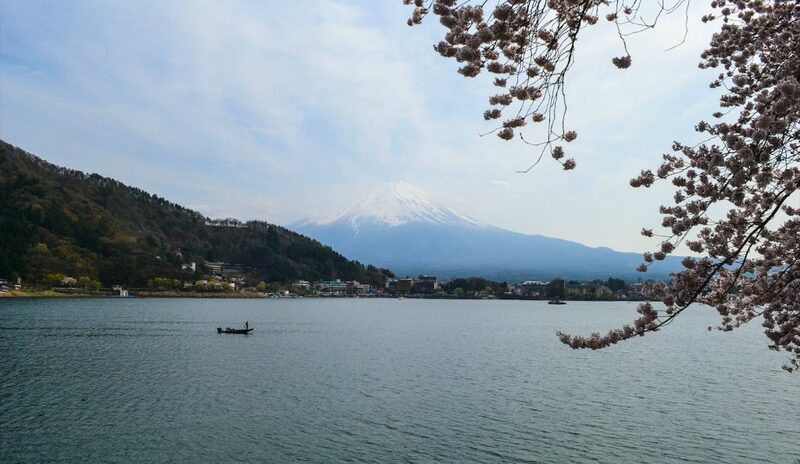 It’s absolutely one of the most picturesque lakes you’ll ever come across, and with the cherry blossom trees lining the northern shores, you’ll be hard-pressed to find a spot as magnificent as this to get a panoramic shot of the blossoms. The best place to view them is on the lakeside promenade on the ease of the Kawaguchiko Music Forest. Access: From Kawaguchiko Station, take the Omni Bus Red Line, and hop off at Ukai Orugoruno Mori Bijutsukan (25-minutes). During the blossoming season, the most attractive street to view the flowers is the Sakura-Namiki Street (which translates to the cherry-tree-lined street). There are around 100 trees which line this street at a whopping 300m long path. For those who are after a no-frills, leisurely stroll to take in the scenery, this is a best option in Nikko – quiet, pure, away from crowds, and you can set your own pace. Access: It is a 3-minute walk from Kinugawa-onsen Station. For a certain period, usually during the full-bloom of the blossoms, the Kinugawa Onsen area lights up their cherry blossoms every night for 7 nights. 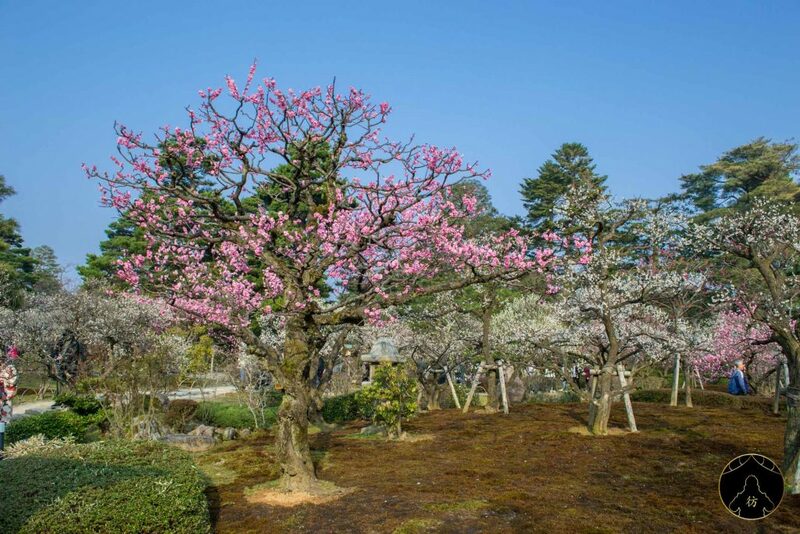 This is a very popular option for anyone who visits the Nikko area during the blossoming season, as they often host the “Night Cherry Blossom Party” where participants gather and picnic over their specially curated boxed bento. Access: 13-minute walk from Kinugawa-koen Station. 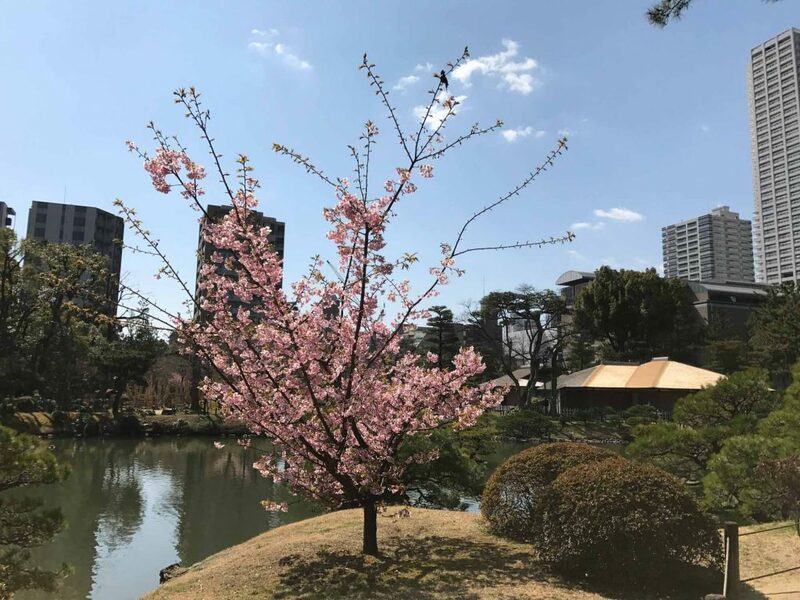 The famous park designed by Isamu Noguchi is not only a great destination to explore your creative inner-artist, but it’s also a gorgeous destination in Sapporo to view the cherry blossoms in northern Japan. There is one section within the park that is condensed with a grove of cherry blossoms, which provide a great picture opportunity. You can spend the rest of the day exploring trails, hanging at the playground, and exploring the famous glass pyramid museum. If you want a panning shot, hike up the hill of Mount Moere – the view from the top is stunning! Access: Head to Kanjodori-higashi Station, then take the local bus 69 or 79 to the park’s east entrance (25-minutes, 210 yen). If you want to picnic amongst cheerful crowds, take a picture of a path lined with beautiful cherry blossoms, and also visit an important shrine all in the one spot, then you’re in luck – you can do all of this at the Maruyama Park, which is located next to the Hokkaido Shrine. Whilst you cannot picnic near the Shrine itself as it is sacred, there are plenty of designated spots for picnics, and you won’t be able to miss it with the crowds. Plenty of street food stalls will be lined up if you haven’t prepared food beforehand! Access: From Sapporo Station, take the Nanboku line to Odori Station. Transfer to Tozai line and head towards Miyanosawa. Alight at Maruyama Koen Station. 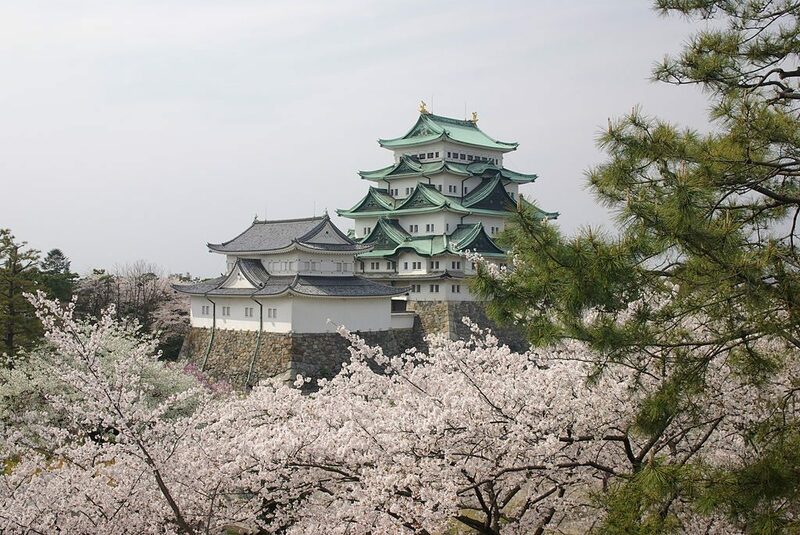 The famous castle is possibly the most famous spot in Nagoya to view the cherry blossoms due to the stunning contrast of the pink blossoms against the pure white detailing of the castle. During spring time, visitations here are notoriously busy, however, with more than 1000 cherry blossom trees surrounding the keep, there will be an area for everyone to take a nice picture. During the peak of the season, we recommend visiting at night, because both the castle and the cherry blossoms become lit and it’s honestly too pretty for words. You will just have to experience on your own. Access: It is a 5-minute walk from Shiyakusho Station. Another popular destination for cherry blossoms in Japan, Shiratori Garden is unique in that it hosts weeping cherry trees (cherry blossom trees which, instead of extending their branches out long and straight, have soft, malleable branches which droop towards the floor). They are rather a unique sight, especially as they are located next to the river. It’s very easy to access also, being located within the city. Access: Head to Jingunishi Station, take exit 4, and walk for 10-minutes. Kanazawa Castle tower burned down in 1602, so unfortunately what you see when you visit it is just the remnants of the residence of the Maeda clan that governed the Kaga domain. However, when you see the beauty of the place during cherry blossom season, you won’t see the remains as a deterrent to the site, but rather it adds to the raw, natural magnificence of the place. The soft pink hues of the blossoms contrasting to the strong white and brown features of the castles really set the scene for a breathtaking cherry blossom viewing. Access: From Kanazawa Station, the Kanazawa Loop Bus (at stops LL9 and RL8) and the Kenrokuen Shuttle Bus will take you to the Kanazawa Castle Park. The one-way ride will take about 20-minutes and cost 200 yen. 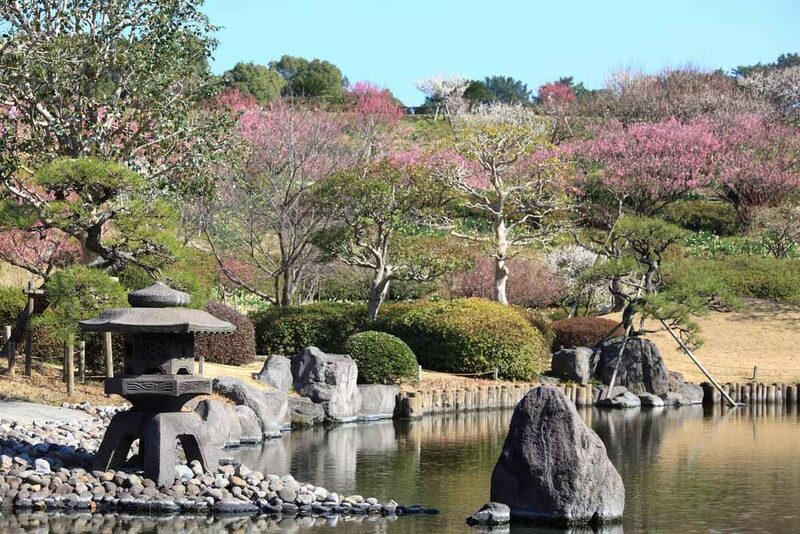 Aside from being a gorgeous destination to view cherry blossoms, Kenrokuen Garden is also regarded as Kanazawa’s leading tourist destination, so why not knock two birds with one stone and visit it during spring? It’s one of Japan’s most beautiful gardens, and is home to more than 400 cherry blossom trees of almost 40 different varieties! It also becomes illuminated at night – simply stunning. Access: From Kanazawa Station, the Kanazawa Loop Bus (at stops LL9 and RL8) and the Kenrokuen Shuttle Bus will take you to the Kenrokuen Park. The one-way ride will take about 20-minutes and cost 200 yen. Considered as one of the most beautiful castles, when you visit Wakayama Castle during the blossom season, there will be no words to describe it. 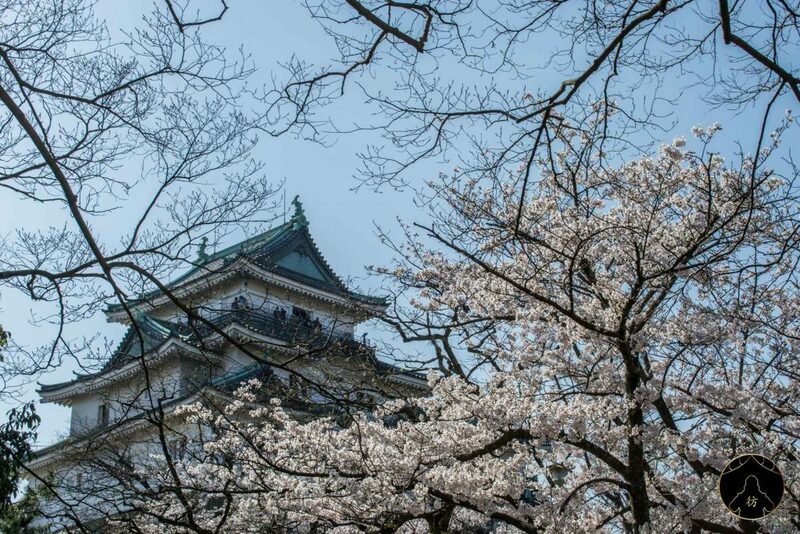 Approximately 600 trees blossom inside the castle grounds, and they emit a sweet fragrance of cherry during the peak of the season, invigorating all your sense. The trees surrounding the castle become illuminated at night and become one of the most awe-inspiring views you will ever see. Access: From JR Wakayama Station, take the Wakayama Bus and hop off at Koen-mae. Wakayama Castle is just a short walk away. The shores of this river will present you with an open-plan, expansive view of around 3000 cherry blossom trees lining the sides and rolling hills and forests in the distance. This is a unique view, one that isn’t seen much by tourists due to its location, and therefore the smaller crowds and less hype means more solitude and peace when you’re breathing in the fresh air and taking in the beautiful view in front of you. There is a Koza River Blossom Festival held annually where people eat and drink and celebrate the splendour of the blossoms in harmony. Access: From JR Koza Station, it is approximately a 40-minute drive by car away. This park is one of the most visited parks in the entirety of Osaka during the cherry blossom season. Its beauty is known far and wide across Japan. Being located in Suita, it is very easily accessible via train from the city. A whooping 5000 cherry blossom trees are planted in this park, meaning you can spend hours just walking amongst the trees, taking your time taking it all in. There are small stalls set up where you can purchase food and souvenirs to bring home. Set up a picnic and watch the falling petals whilst sipping on some sake, this park is the perfect place to enjoy your hanami picnic. Access: Take the Midosuji Subway line from central Osaka (Tennoji, Namba, Umeda) to Senri-Chuo station, where you will need to transfer to the monorail. The entire trip to the park will take 30-50-minutes and cost around 500-700 yen. Whilst the Arashiyama Bamboo Forest has exponentially grown in popularity in the recent years, most foreigners are unaware that Arashiyama is also where the locals have been going for many, many years to view the cherry blossoms also. 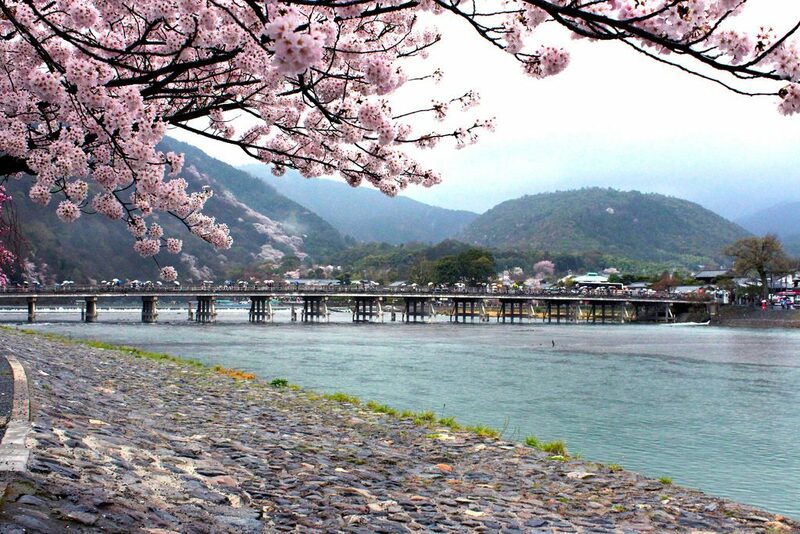 It’s a scenic spot that absolutely paints the perfect picture of cherry blossoms amongst an old, history Japanese town setting, complete with the Kamogawa river. 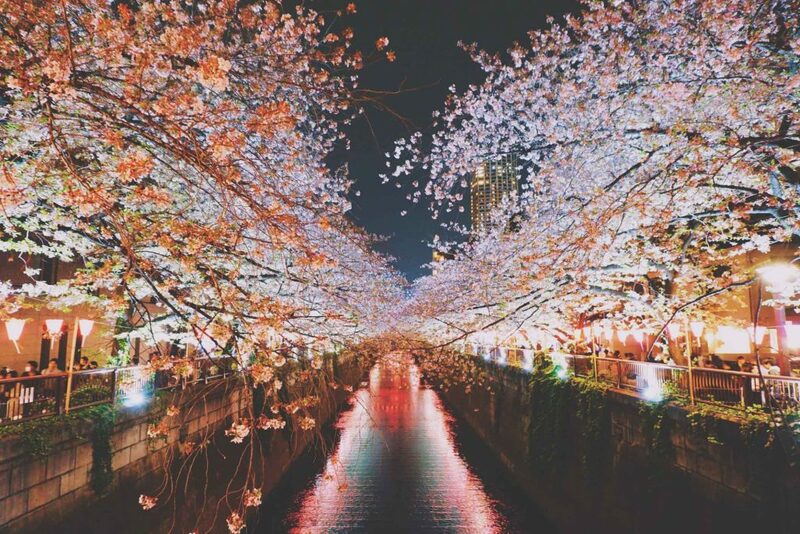 1,500 cherry blossom trees shine during the day, and illuminate the city at night. If you’re feeling like doing something out of the ordinary, hope on a boat and it’ll take you gently down the river for a different perspective on the cherry blossoms. Make it an entire day of Arashiyama and visit the bamboo forests whilst you’re there. Access: From Kyoto Station, take the train to Saga-Arashiyama (15-minutes, 240 yen). From there, you can walk to central Arashiyama in 5-10 minutes. Nara Park – Blossoms and Deers, what more could you ask for? Nara Park is the most popular attraction in Nara, and rightfully so – the deer there are some of the cutest you’ll ever see! 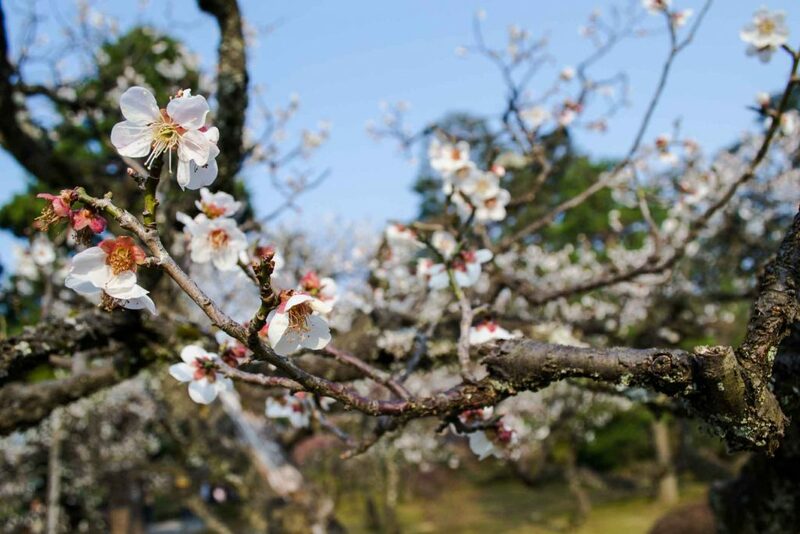 During the cherry blossom season, approximately 1,700 cherry trees (including Higan cherry, Yoshino cherry, Yamazakura mountain cherry, Narakokonoe cherry, weeping cherry, and Satozakura cherry) line the massive park. 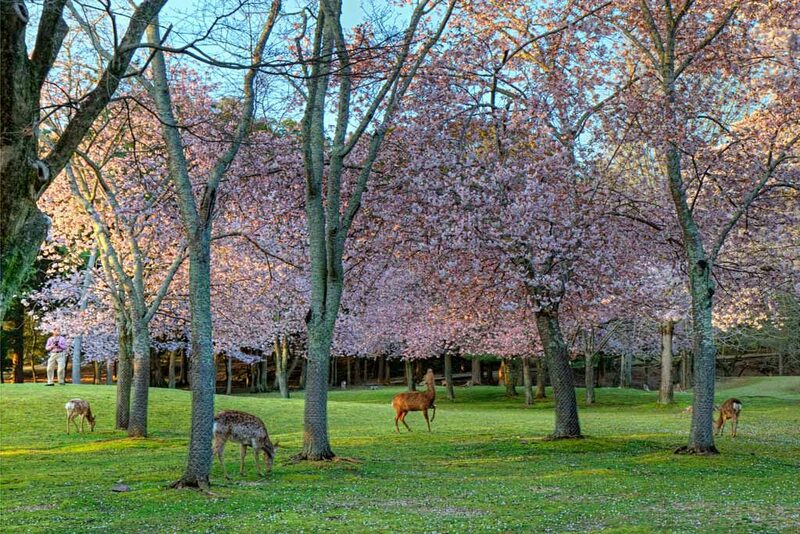 When you visit the deer during this period, capturing the blossoms in the background will make your experience and pictures turn out infinitely more memorable and stunning. Access: Head to Kintetsu Nara Station and walk 5-minutes, or JR Nara Station and walk 20-minutes. Miyajima Island is already one of the most picturesque islands in Japan, but if you go during the cherry blossom season, the flowers take up the beauty by a million notches. Sakura trees sweep through the mountains, the hills, the streets and the gardens – it’s quite a magical sight. 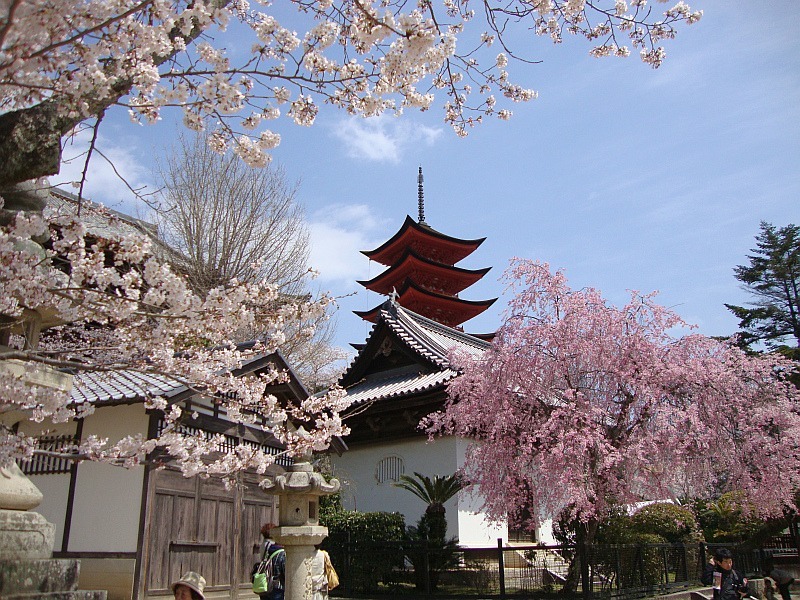 If you do visit the island, we recommend heading to Momiji-dani Koen where there is a high concentration of cherry trees and strolling through will make you feel nostalgic, and/or viewing the blossoms from the five-storied pagoda, where capturing the pagoda framed by the surrounding cherry blossom trees will make for a stunning picture. At night, the entire island is lit up during the peak blossom season, and it is simply stunning – words cannot describe. Access: From Hiroshima Station, tahe the JR Sanyo Line to Miyajimaguchi Station (25-minutes, 410 yen). From there, it is a few minutes walk to the ferry pier (follow the crowd). Both JR and Matsudai ferries take 10-minutes and 180 yen to get to Miyajima Island. Whilst the Peace Memorial Park brings in crowds every year to celebrate the hanami, some people frown upon the act as poor taste. However, the nearby Shukkei-en Garden, whose beauty also draws in couples who want their wedding photos taken there, is a wonderful and lesser known place to view the cherry blossoms. Weekends get a bit crowded, but if you go during a weekend, it’s the perfect time for some gentle reflection and calm appreciation of the sakura trees. Access: From Hiroshima Station, it is only a 15-minute walk. This seaside park is famous throughout Japan for its various seasonal flower festivals, but the cherry blossom festival might be its most stunning one yet. 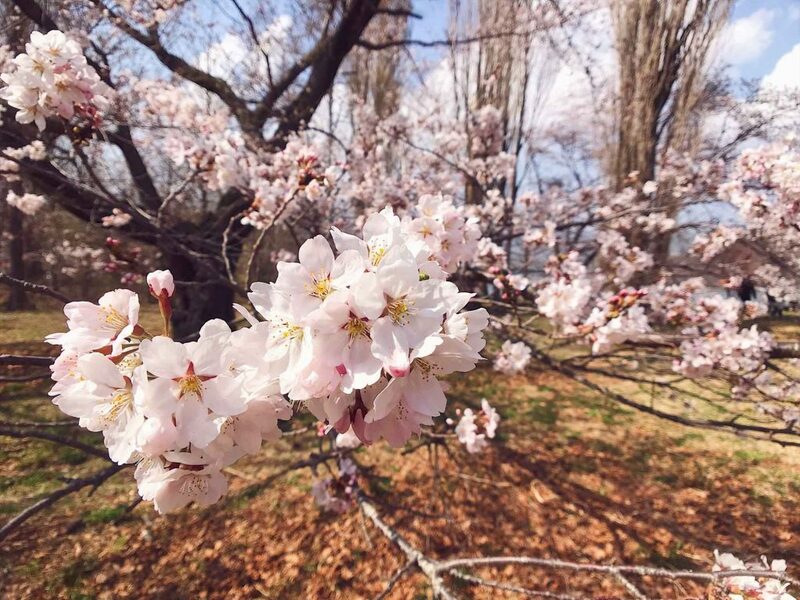 During the season, there are approximately 2000 cherry trees blossoming throughout the park, alongside an amusement park, various flower gardens, manicured lawns, playgrounds and so on. 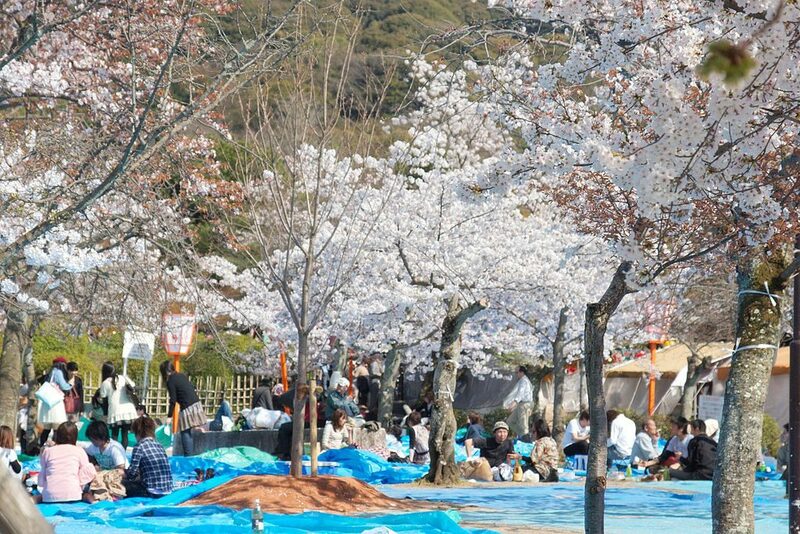 Some of the best hanami parties are held here, and visitors flock here due to its size (there can be absolutely massive crowds and you’ll still get a good space), and the various footpaths to stroll along and cycling paths where you can hire a bike to cycle through. Access: From Hakata Station, take the JR Kagoshima Line to Kashii Station (10-minutes) and transfer to the JR Kashii Line to Uminonakamici Station (20-minutes). It will take 40-minutes and 460 yen. Nishi Park – Blossoms Right in the Middle of the City! 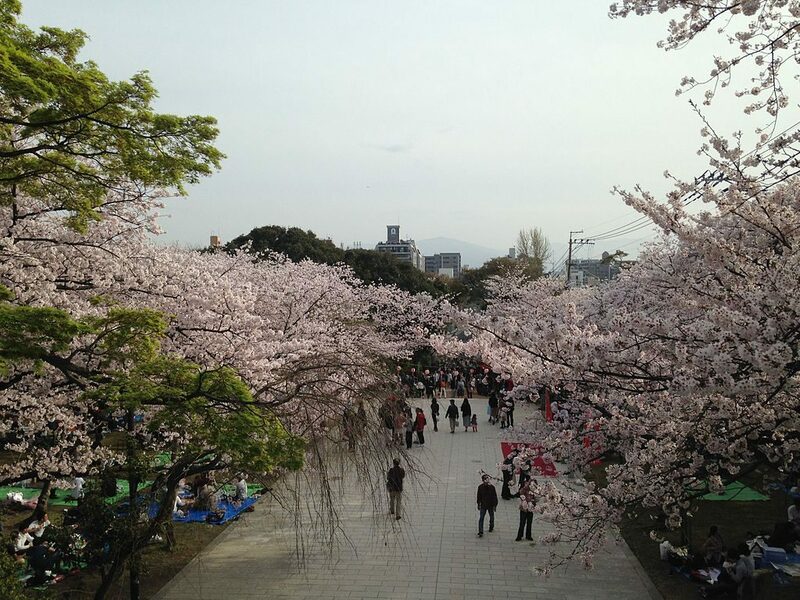 Nishi Park is one of the most popular places to enjoy cherry blossoms within Fukuoka City itself. Due to its location as a hillside park, it provides sweeping panoramic views of Fukuoka City and Terumo Shrine which is what attracts the big crowds. It’s considered one of Japan’s Top 100 cherry blossom viewing spots. Get in with the festivities and purchase some food from the multiple food stalls, and head to the observation platform to enjoy the views with hundreds of other hopefuls trying to capture the perfect image. The illuminated park at night means you can stay all the way into the evening and the parties will still be going. Access: Hop on the Nishitetsu Bus and alight at Nishikoen. It is a 10-minute walk from there. In the northern part of Kagoshima City (Kyushu Island) lies Yoshino Park, a massive sprawling park that is home to over 800 cherry blossom trees (featuring 12 different types of cherry blossoms!) throughout that bloom magnificently. Majority of the trees reside in a grove on the southern end of the park, and their concentration means that anyone who wants to picnic there at the peak blossoming period will be rewarded with a wonderful backdrop of falling petals and vast green fields. Access: Hop on the Yoshino Park bus at JR Kagoshima Chuo Station and alight at Yoshino Park (25-minutes). 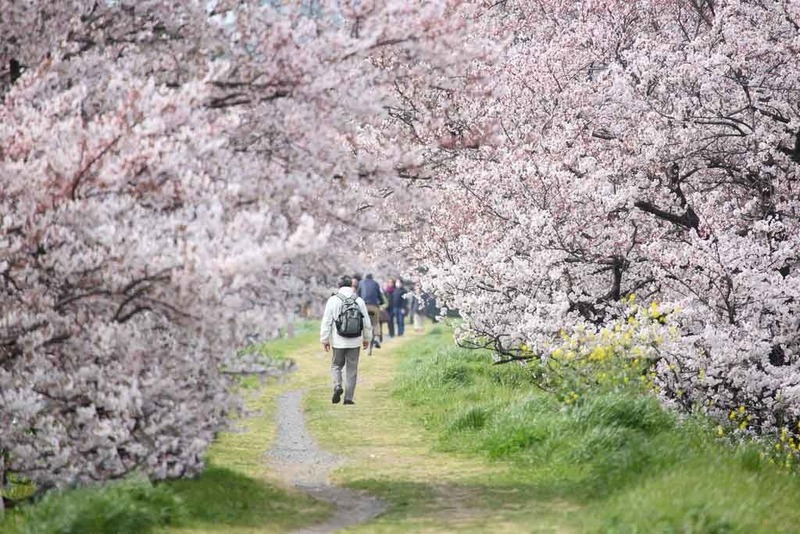 On the hills of Isa City lies Tadamoto Park, a park that showcases a 2km stretch of overflowing cherry blossom trees from late March every year. The park is particularly popular with visitors to Kagoshima during this period because of its abundant of features such as a lawn, walkway, an observatory, and a children’s playground. Chochin lanterns are attached to the trees at night that illuminate the park beautifully, making for a super romantic stroll. 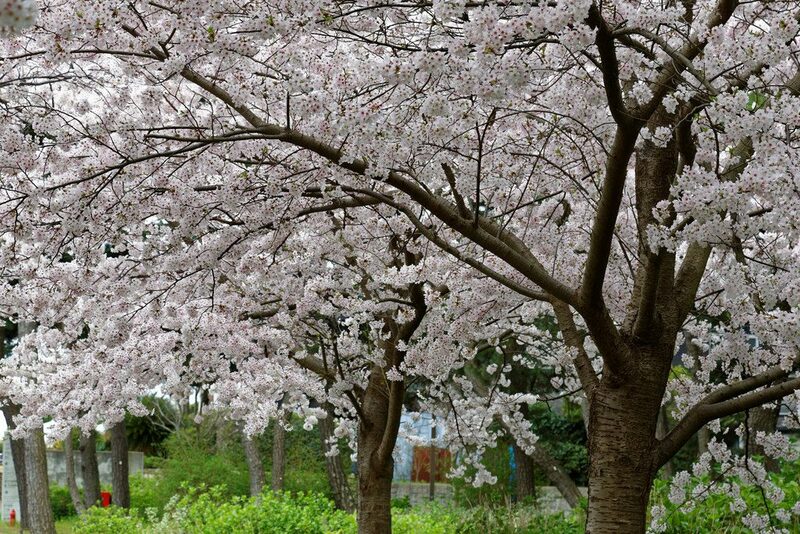 The annual Tadamoto Park Cherry Blossom Festival is usually held on a Sunday during the peak season. Access: From Shin-Minamata Station (Kyushu Shinkasen Line), Tadamoto Park is a 50-minute bus ride. 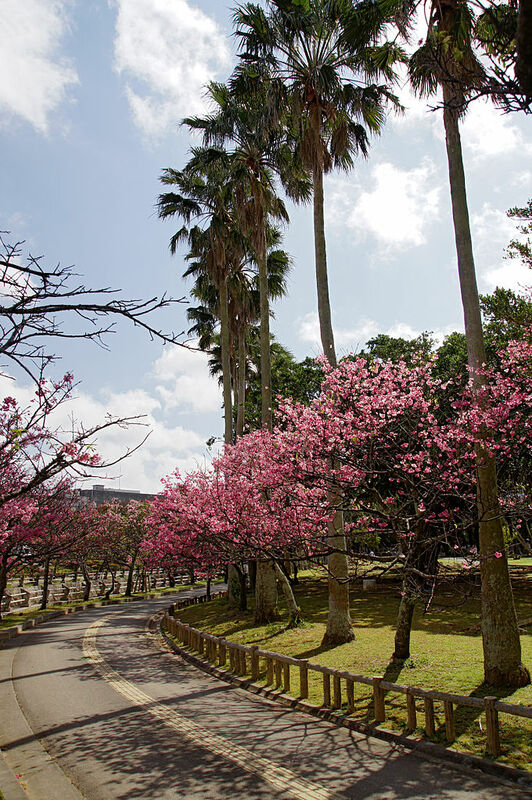 Located just a 15-minute walk away from the bustling street of Kokusai in Naha City is Yogi Park, the perfect answer to a day out with the family, enjoying the blossoms without having to worry about getting to and from. 400 cherry blossom trees bloom alongside the river, which creates a spectacular image and during the peak of the season, there is also the ‘Naha Cherry Blossom Festival’ you can attend. Music, performances, and food will all contribute to a great night. Of course, being in Naha, you’ll also find palm trees lining up with the cherry blossoms, creating quite a sight! For the kids, there are jungle gyms and a small playground to play at. Access: It is only a 15-minute walk from Kokusai Street. 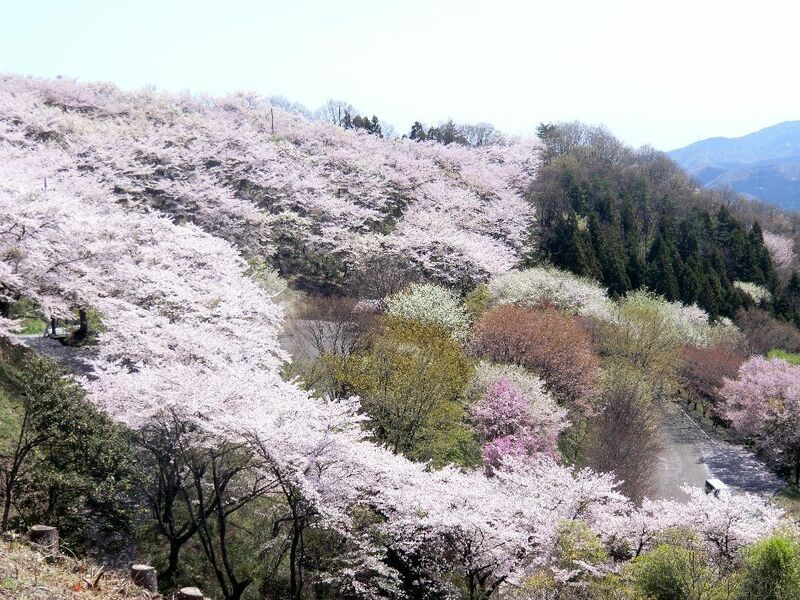 In Yae-Dake, you will encounter a darker shade of cherry blossoms than normal. This destination is on a mountain however you will still be able to drive your car up. 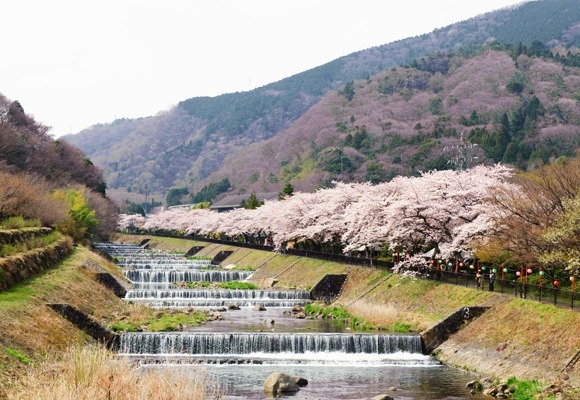 It’s known as one of the best places to view cherry blossoms in the prefecture due to its location on a sloping hill and the swee views you’ll see. There’s a festival that usually runs from the end of January to the beginning of February that celebrates the blossoms, with many food stalls opened and live music playing. Be warned: it gets incredibly busy with the locals and visitors during this period so prepare for some traffic jams on the way there! Access: From Okinawa Expressway 10 Exit, travel north on Highway 58 through Central Nago. Following route 84 (on the left) past Pineapple Park. Keep going until you see a large white landmark sign that says “Mt. Yaedake” on the left. Keep going until you see the parking lot. Almost all travellers heading to Japan for the cherry blossoms come during spring (this is almost a guarantee). However, for those you who simply cannot make it during springtime, there is still the idea, unbeknownst-to-many, of coming during Autumn to view the ‘fuyuzakura’ (Japan’s famous winter cherry blossoms), which generally blossom during during the end of October through to the beginning of December (but the best time to go would be mid-end of November as that’s when the full bloom is generally happening and you get the most of the ‘koyo’). The most famous place in Japan where this happens is Sakurayama which is located in the Gunma prefecture. Whilst this is a strange concept for some, imagine the marriage of gorgeous pink sakura blossoms with the beauty of the autumn ‘koyo’ (Japan’s famous foliage), and, yep, it’s as magnificent as you thought. During the peak of the season, Sakurayama becomes illuminated at night, and it’s quite possibly one of the most romantic settings in all of Japan. Twinkling lights, red and orange leaves in the background, pink cherry blossom in the foreground, it’s really as outstanding sight. If you go plan to head here for the blossoms, check with the Japanese travel websites to see when the blossoming is happening so that you don’t come too early/too late. As they usually peak for a very short period of time, this needs to be taken into considering. Access: It is a 35-minute car right from Fujuioka IC of Joshin-Etsu Expressway. 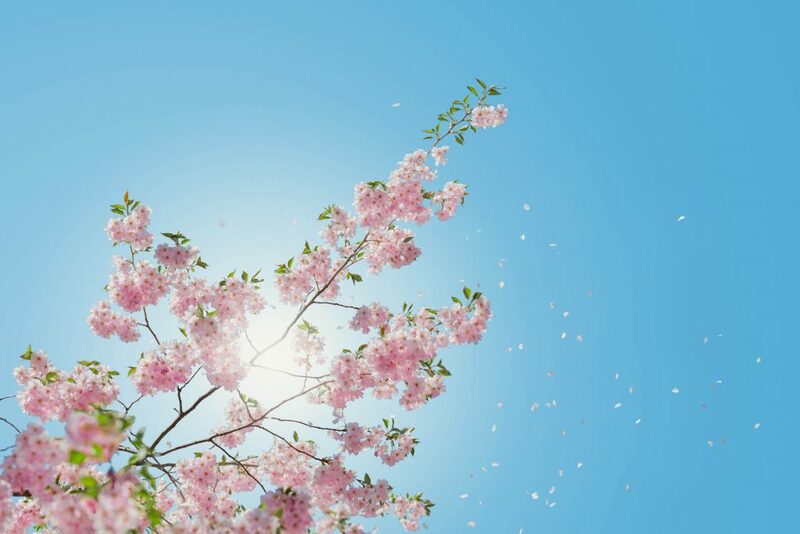 As you can see from this extensive, exhaustive list, there is a plethora of ways to enjoy the cherry blossoms in Japan during the season, wherever you may be. If you’re a Japan enthusiast, a flower fanatic, a seeker of natural beauty, or just want to see another another wonder of Japan, plan your trip for the hanami season. The mass celebrations, infectious cheerful vibes, and lively atmosphere is not quite like anything else in the world. Don’t forget you can always subscribe to my social media accounts if you haven’t yet to read even more articles and see more pictures of my trips to Asia: Facebook Page, Facebook Group, Instagram, Youtube and Pinterest. Hey , i am visiting in this cherry blossom season in early april.Want to know if it would be better to take a day tour for cherry blossom viewing or cover some of these spots mentioned on our own.What would you recommend?